Desiccants are used to protect goods during transportation and storage against the negative effects of moisture and humidity. 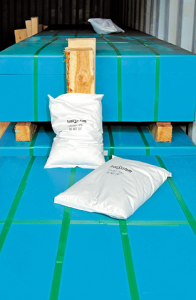 Our range consists of three products: Dri-Pack, Hygro-Bag and silica gel. Dri-Pack and silica gel is developed specifically for application in industrial packages such as boxes, cardboard boxes and crates. Hygro-Bag however, was developed for use in containers.